Major supermarket Waitrose has added a dedicated vegan section in its shops - making it the UK retailer of its kind to do so. In addition, the supmarket retailer has doubled its veggie and vegan range - by adding more than 50 products - which launched in store today. The products will include a number of ready-meals and meat-alternatives. 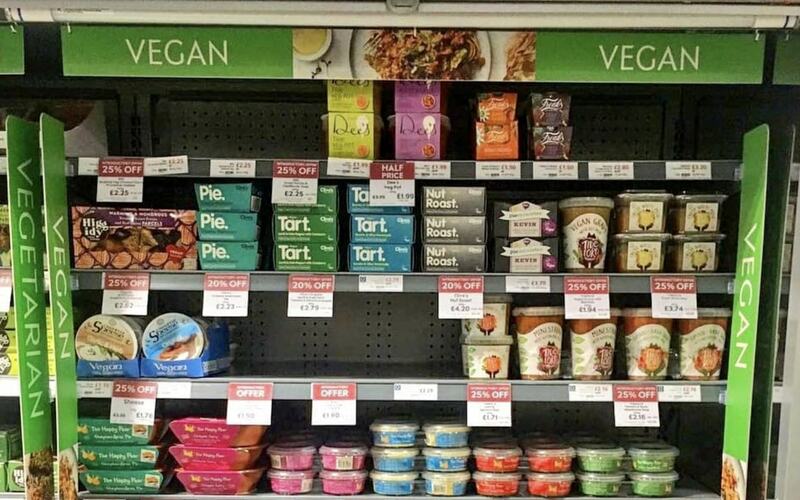 Waitrose employee and vegan - Aaron Calder - took to Instagram to share a picture of the new section, and write: "I'm so proud to work for @waitrose The first UK 🇬🇧 supermarket to have a #vegan section!! Now it's easier than ever to get your hands on delicious vegan food!" As part of its expansion, Waitrose has exclusively teamed up with two brands - The Happy Pear, plant-based and wholefood chef duo David and Stephen Flynn, and a Dutch company called The Vegetarian Butcher which makes meat substitutes. David and Stephen Flynn, Co-founders of The Happy Pear, added: "We are chuffed to be entering the UK market with our products and really honoured to be working with Waitrose to expand its vegan range. "We have been working with Waitrose since 2016, creating vegan recipe videos and on customer events, and this is a great, growing partnership, which supports our mission to help people live healthier and happier lives." These new options are just part of a surge in vegan and vegetarian products becoming available in the UK. Earlier today, it was revealed that supermarket giant Tesco will be launching a new plant-based steak across 400 of its UK stores - aimed at targeting the burgeoning flexitarian, as well as veggie/vegan market - the same group Waitrose wants to appeal to. According to Graves: "With flexitarianism also on the rise, we have made sure we have dishes and ingredients for those looking to opt for a meat-free meal, that was suitable for the whole family to enjoy."